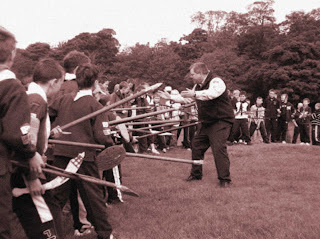 Above : Rare archive photograph of Zulu warriors preparing for battle. After a few fairly normal weekends, campers at Fordell had a bit of excitement this Sunday as Bob the warden laid on a flagbreak with a difference. It is a fairly well-known fact that his favourite film of all time is the epic 'Zulu', which tells the true story of how a small group of Welsh Guards overcame a huge Zulu army in South Africa in 1879. 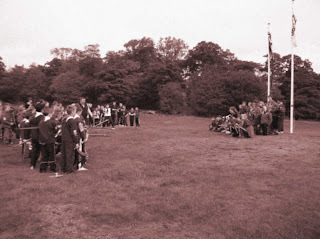 Enlisting the help of dozens of cubs and scouts, Bob managed to perfectly recreate the final battle scene on flagpole hill (AKA Rorke's Drift), after telling them all about the history of the battle and the lessons which they could take from it. The Welsh Guards were made up mainly of Scouts, who treated the bystanders to a very out-of-tune-but-vaguely-recognisable version of 'Men of Harlech'. The Zulus, in contrast, were made up of Cubs who seemed to have spent most of the Saturday making spears and shields for the event. Above : Standoff between Zulu warriors (left) and Welsh Guards (right) at Rorke's Drift. In keeping with the historical records, the Welsh Guards managed to successfully defeat the Zulu army, with the exception of one cub who refused to give up and crawled across flagpole hill to assault the Scouts with his cardboard spear, much to everyones amusement. Those who missed out on this exciting event will be pleased to hear that it will run again on a random sunday, next year sometime. 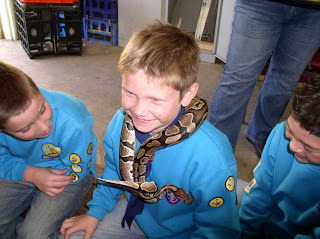 Above : New self-fastening neckie, being tested by beaver scouts. After the battle had died down, the cubs and scouts swapped their battle gear for bows, arrows and climbing harnesses and spent the morning taking part in more normal site activities. Later in the morning, a huge army of Dunfermline District beavers arrived on site for a funday which lasted all afternoon. The beavers were split into small groups with an adult helper and went round the site taking part in lots of different bases. The most popular by far seemed to be in the wet weather hall, where a local pet shop had brought along a selection of reptiles for the beavers to see. Unlike most of the leaders, the Beavers seemed perfectly happy to handle the reptiles, especially the snake which seemed to be showing off by tying herself in some complicated knots, all without referring to any knot/pioneering books! That's all for now, though visitors to Fordell next weekend should note that on Sunday morning Bob will be re-enacting the classic film '20000 Leagues under the Sea', so please bring full diving gear and cardboard submarine with you.